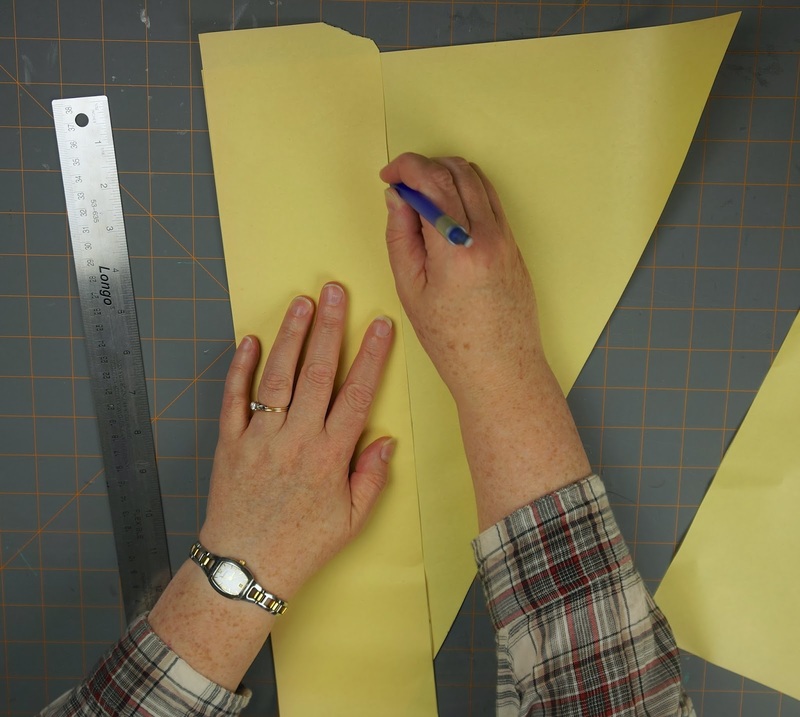 We're going to start off by making the template for the pillow. 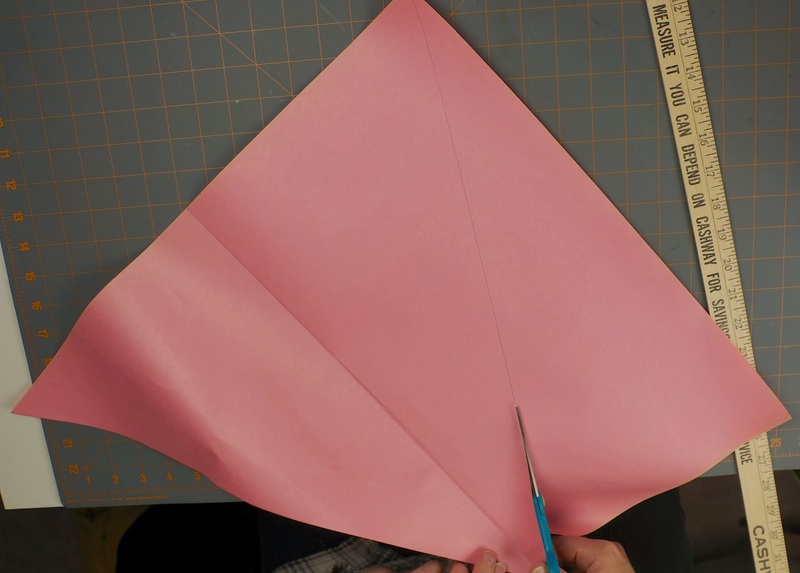 Taking some newsprint/ large pieces of paper, measure out one side of the triangle to the length you want the finished pillow to be. 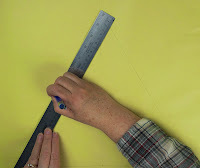 Then measure and mark the middle of that line. 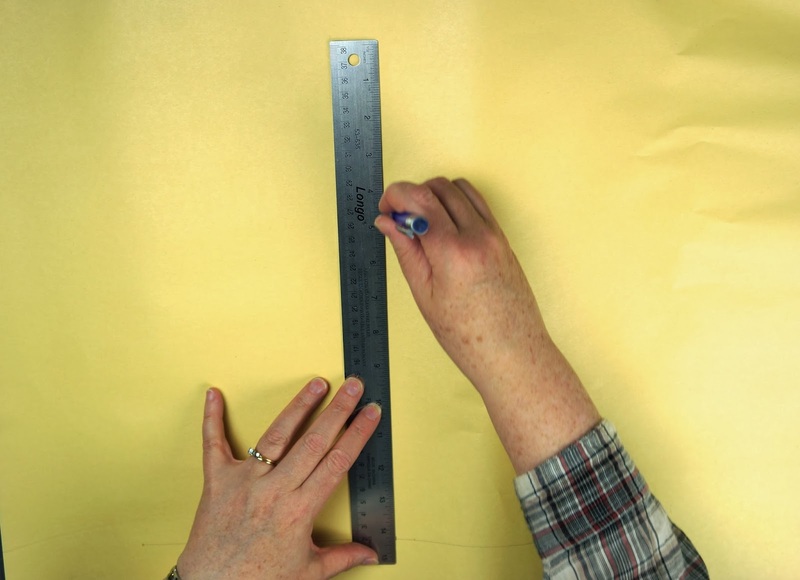 Next, draw a line upwards from your marked center of your bottom line. 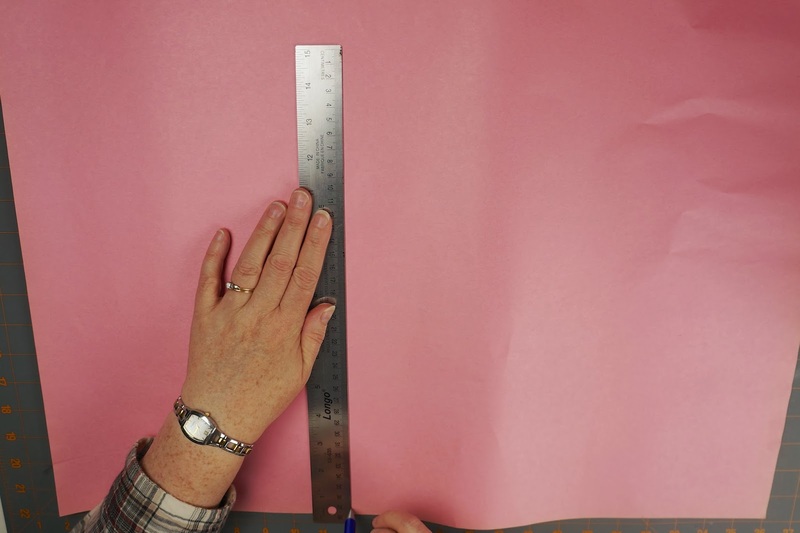 Next, taking your ruler, measure a length the same size as the bottom line that goes from the middle line to the end of the bottom line. 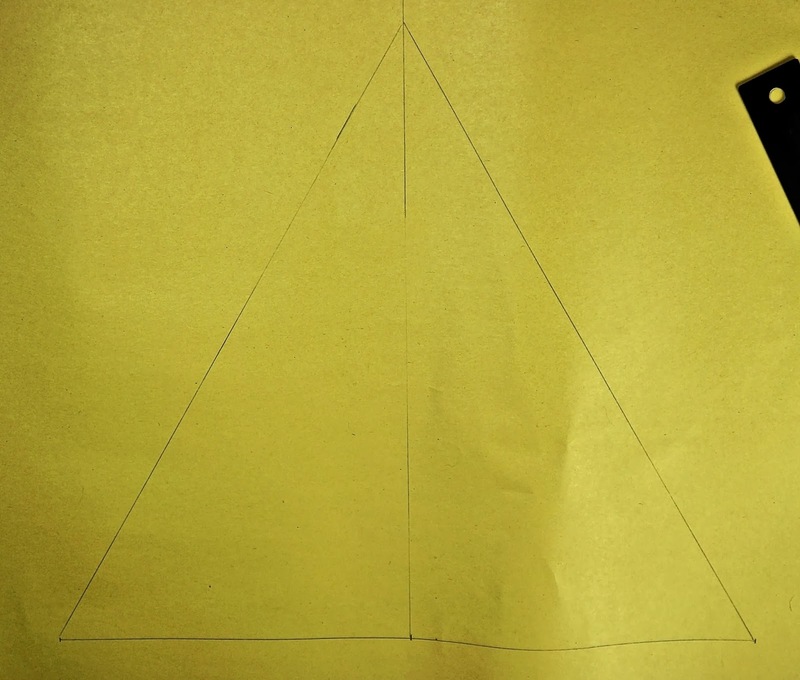 Do the same thing for the other side so that you have an equilateral triangle. 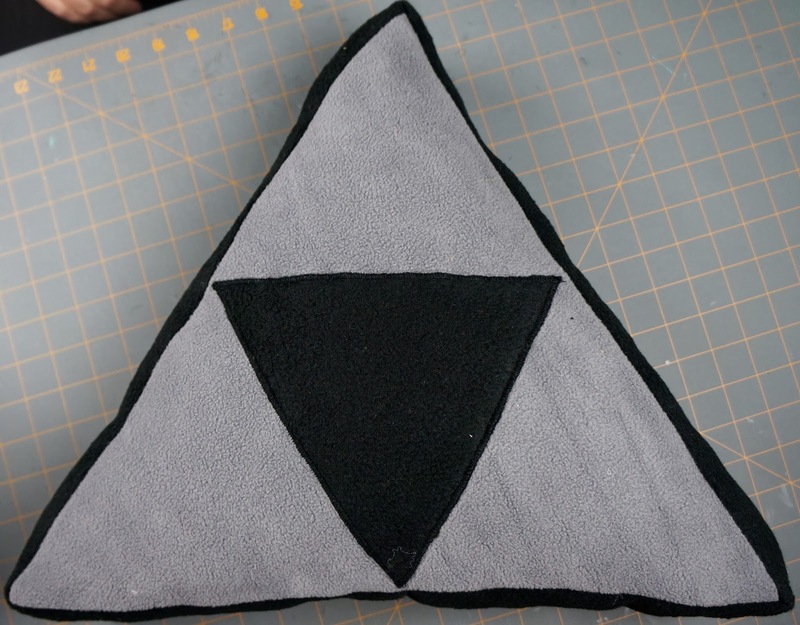 Now to turn the triangle into the Triforce. First, measure and mark the middle of the sides of the triangle on both sides. Then draw a line between them. 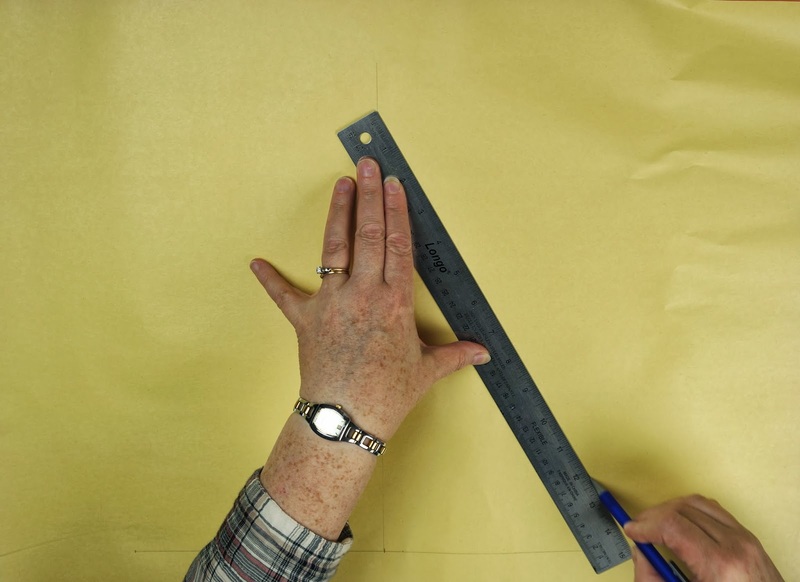 Next, draw a line from the middle of one of the sides to the middle of the bottom line, and do that for both sides. 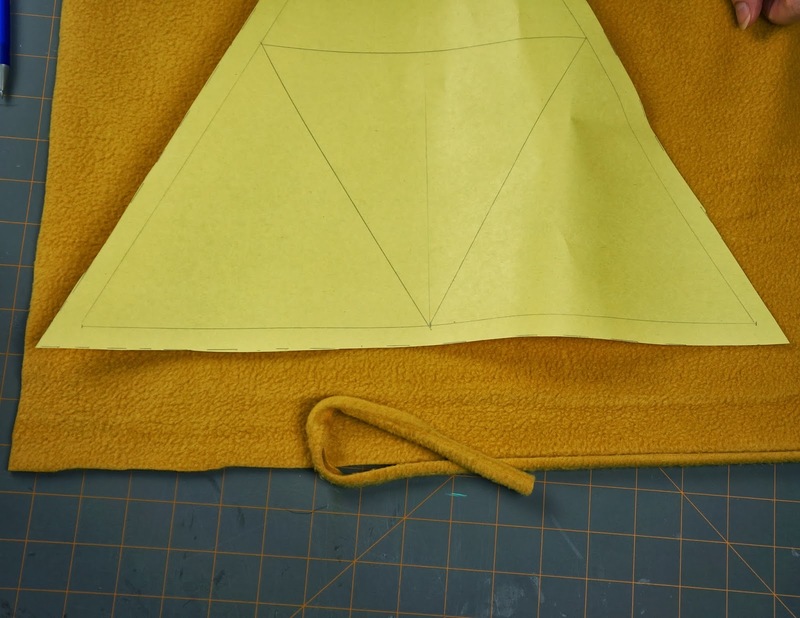 Now its time to add the seam allowance. 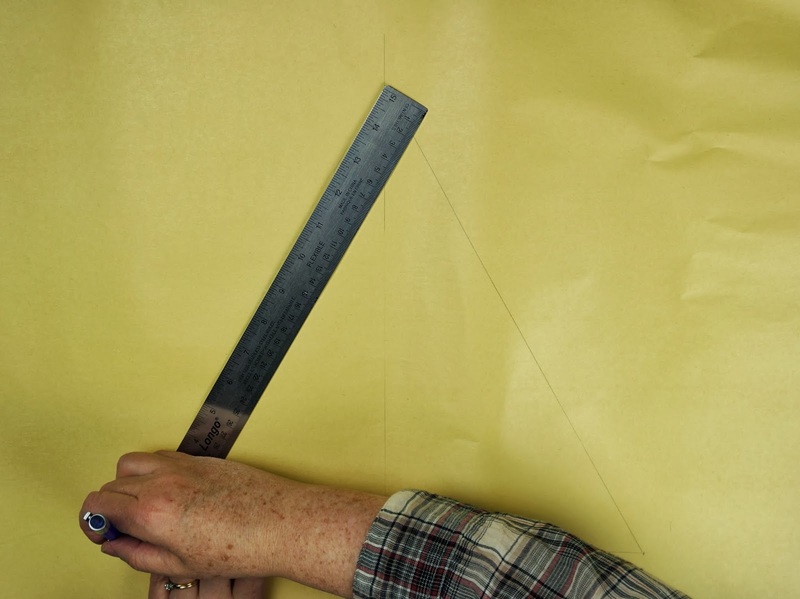 Measure half an inch around the entire perimeter of the triangle. Then you can cut out your template on the seam allowance line. Now it's time to make the template for the edge of the pillow. 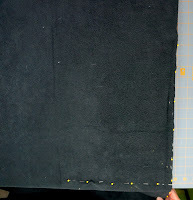 Figure out how thick you want your pillow to be, then add an inch to that width (seam allowance). 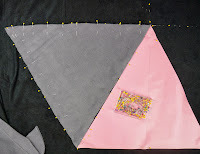 We ended up doing 3" (4" with seam allowance). 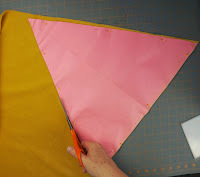 You can use the scraps left over from cutting out the triangle. Make sure you have a length that will go around the entire pillow plus a few extra inches. Next we're going to take the gold fleece and cut the selvage off. Then pin the template to the fabric well and cut it out. Do the same for the grey fleece. 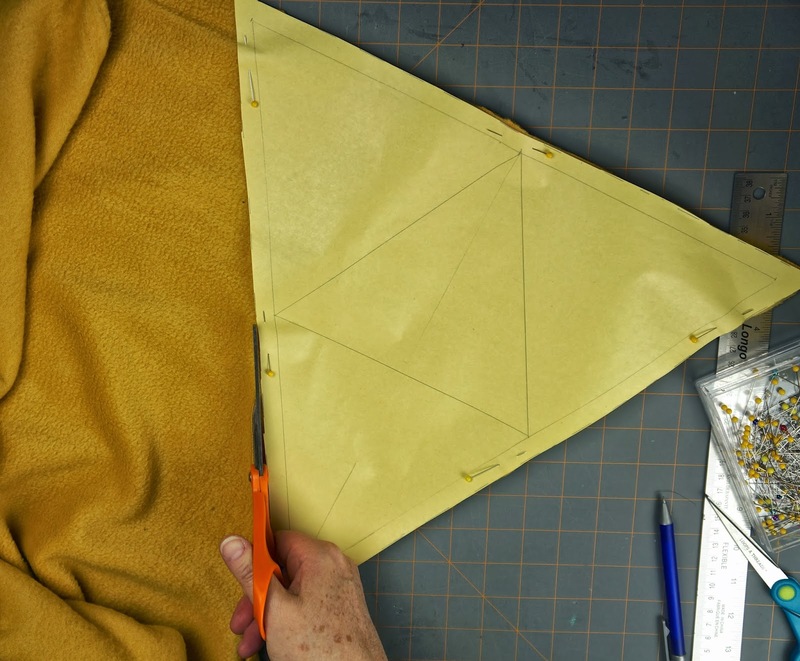 Take your template and cut the middle triangle out of it. 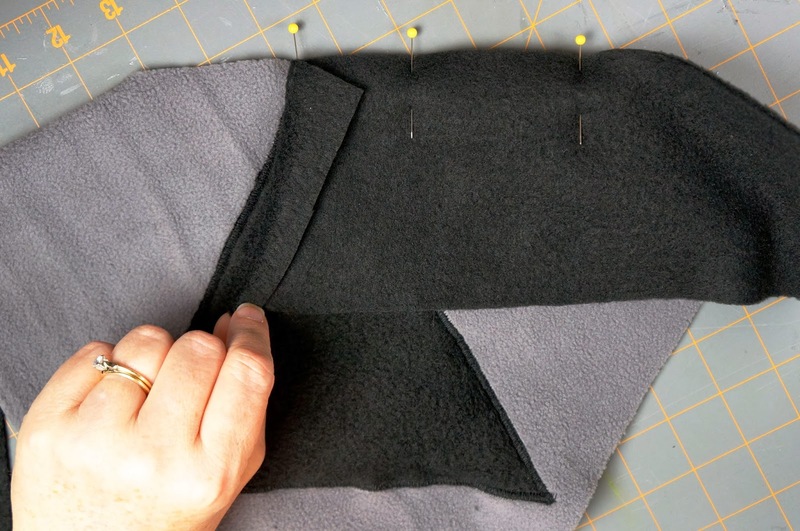 Now, take your black fleece, double it up and pin it together so it doesn't move around. Then take your template for the edge of the pillow, fold that in half and pin it to the fabric. 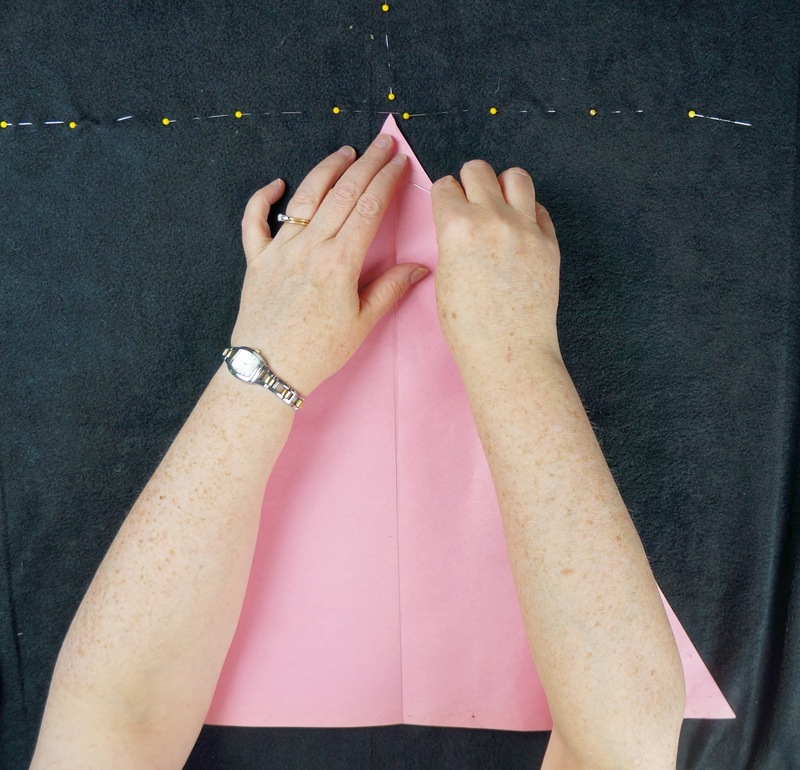 Once it's securely pinned down, cut out the piece. 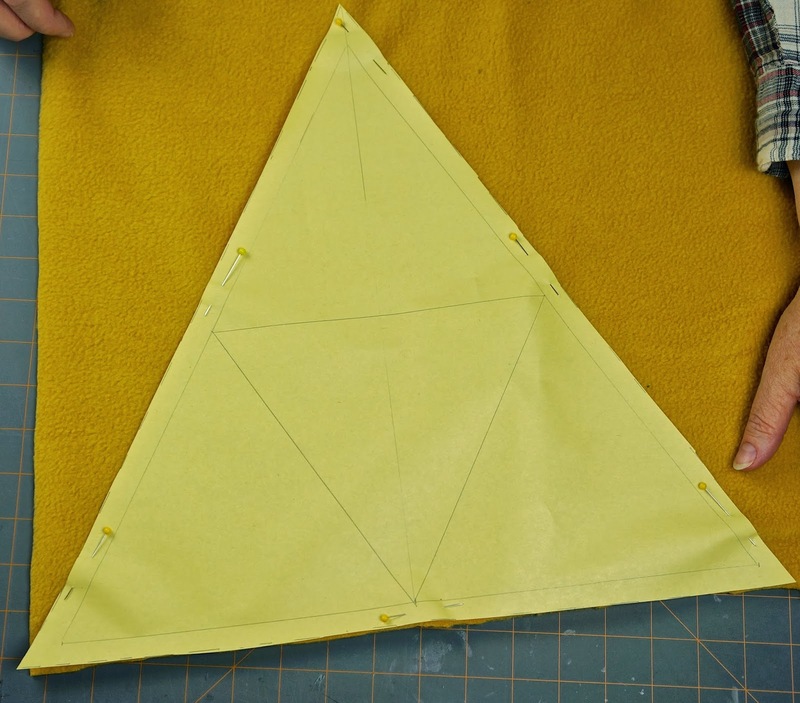 While the fleece is still doubled, take your inner triangle template, pin that down and cut it out as well. 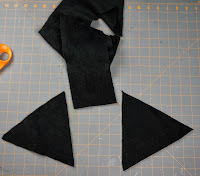 You should have one very long strip and two small black triangles. 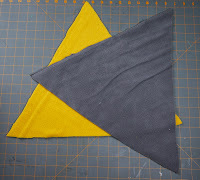 Take one of the black triangles and one of the pillow sides (grey or gold) and center the black triangle. 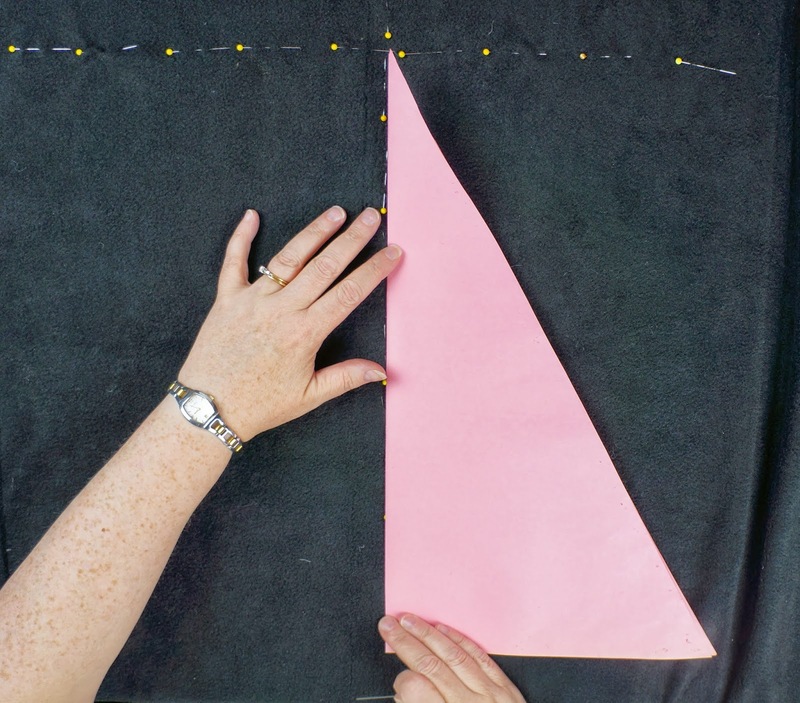 Measure and make sure the points of the black triangle are half an inch in from the edge (seam allowance). 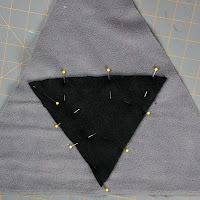 Once it's centered pin the black triangle in place. 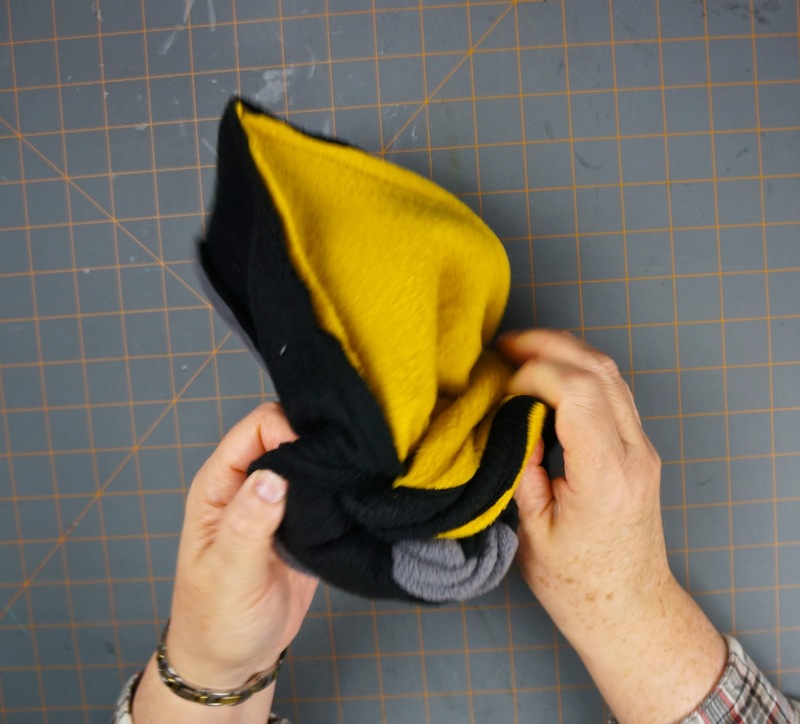 Now you can begin to sew it on. 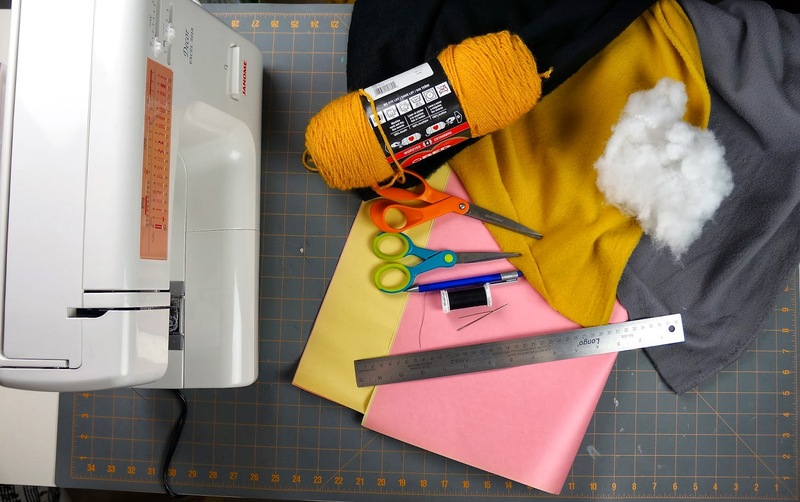 You can hand sew this or use a machine like us. 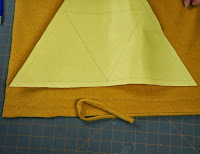 We used a wide width zig-zag stitch (satin stitch). Starting at the bottom of one of the Triforce pieces, begin to pin the side strip along the edge. Leave an inch or so extra at the beginning. 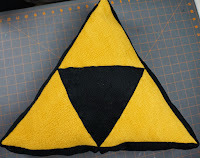 Begin to straight stitch it on to the sides of the Triforce. Sew one side at a time for better results. When you get to the bottom again have some overlap without any raw edges. Make sure you don't close up the bottom yet. 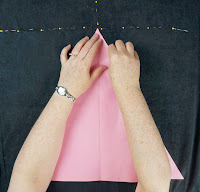 Sew the side all the way along but don't sew the two ends together yet. Now pin the other side of your pillow onto the strip. 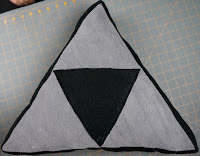 Make sure that the finished side of the Triforce faces inward. 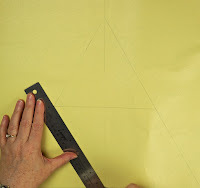 Pin the points of the triangle first to get both sides to align. 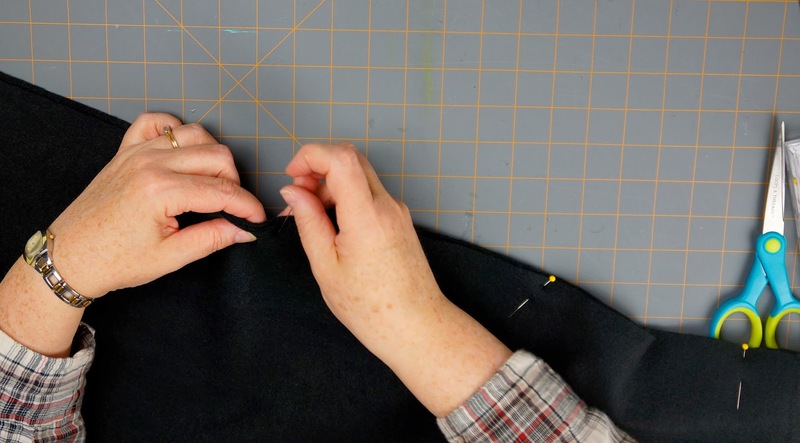 Once the side is pinned on, begin to sew it on. 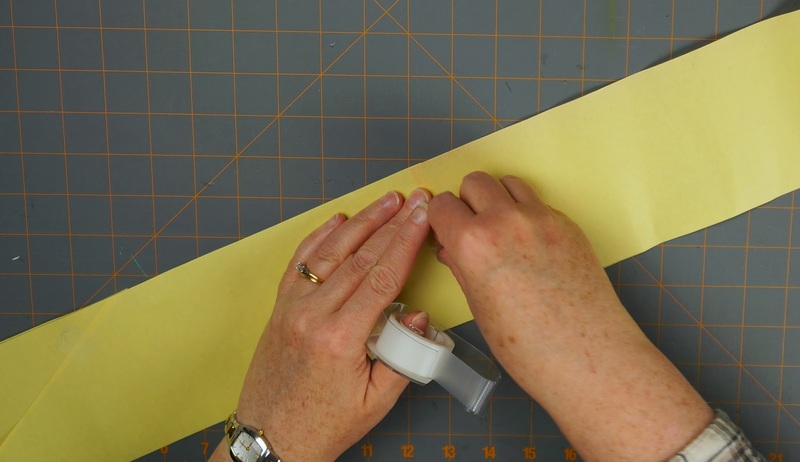 Using the opening in your strip, turn the pillow right side out. Now it's time to stuff! 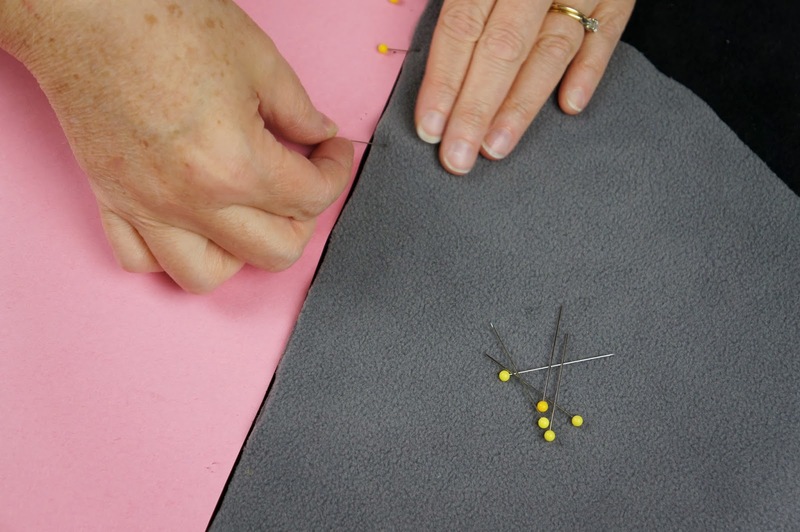 Using the same opening in the side, add polyester stuffing to the pillow form until it's to your desired firmness. Pin the opening closed and hand sew it together. There you have your finished pillow! Now on to the blanket! 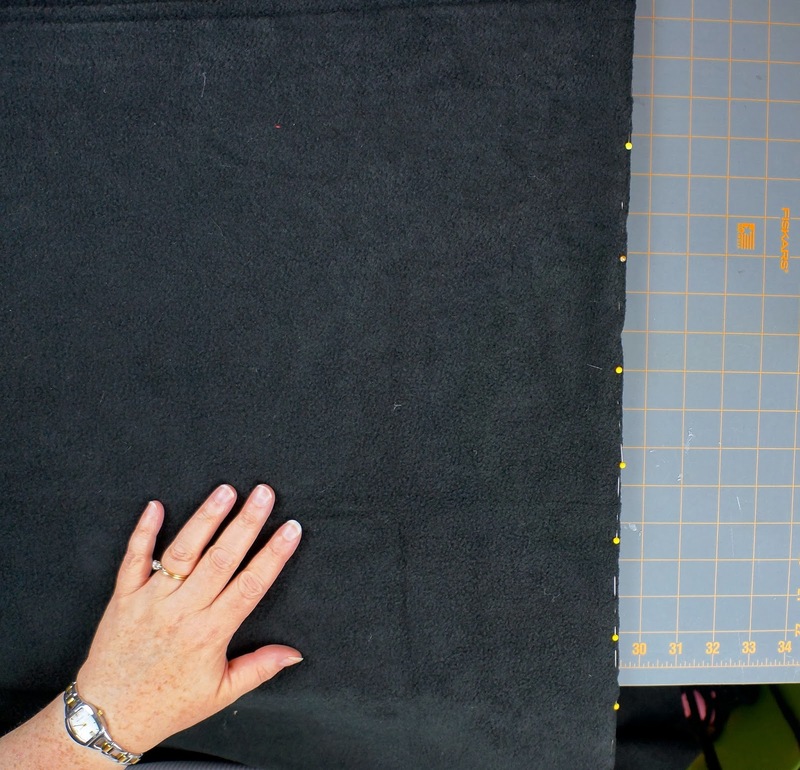 Before you start making the template for the blanket, you'll want to figure out the size you want your blanket to be. 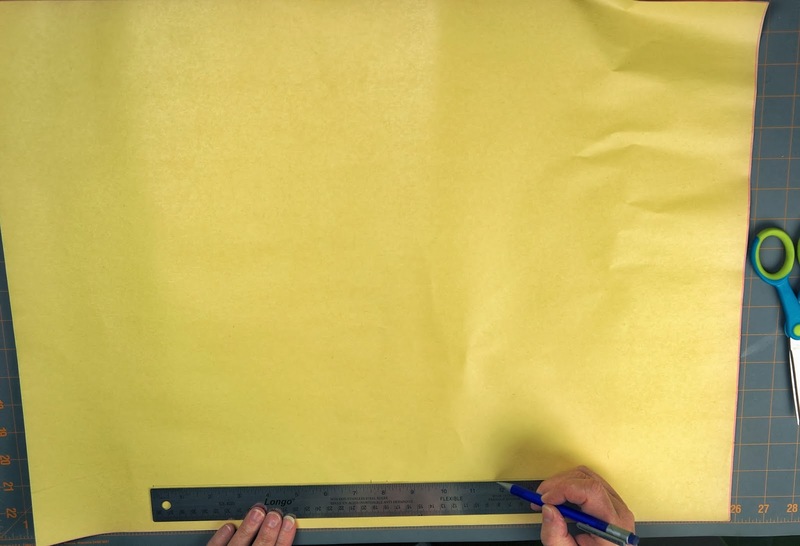 Ours is going to be 60" x 90". We're going to start off by making the template the same way we made the pillow template. So start off by measuring out the size you want one of the triangles of the Triforce to be. 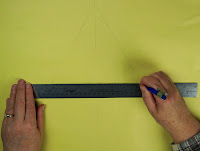 Start by drawing one side, then measuring the center of that line. Draw a line up from the center mark and measure the same distance (as the bottom line) from the end point of either side to the center line. 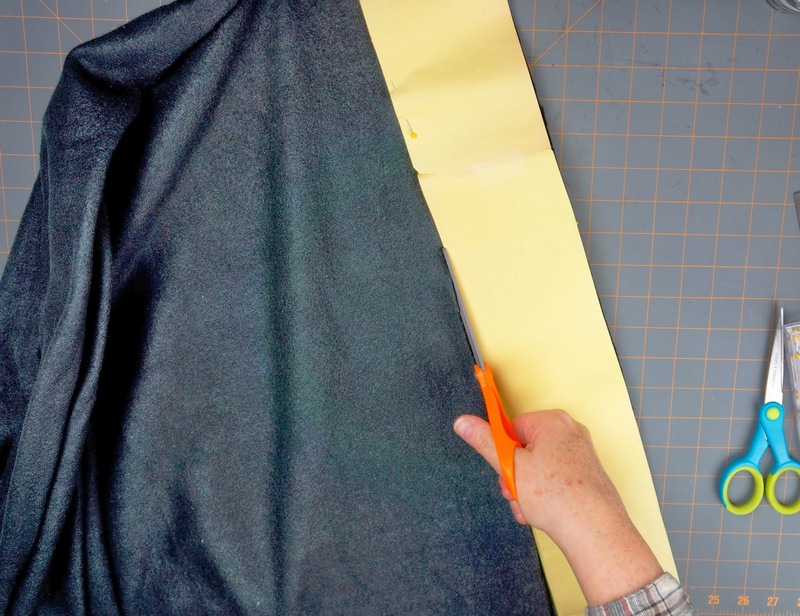 Don't add seam allowance. We used a 20" triangle. Now cut out your template. 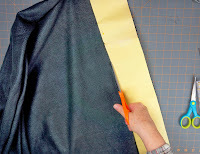 Take your template and pin it to one of the fleece colours. Then cut the triangle out and repeat so that you have 3 gold triangles and 3 grey triangles. Prepare the main blanket by cutting the selvage off. 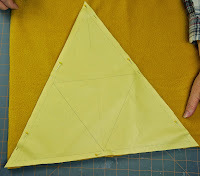 To find the center of the blanket for the placement of the triangles, begin by folding the blanket length wise, with right sides out, and pin along the fold. Do the same for the width so that you end up with a cross of pins when you open the blanket up. 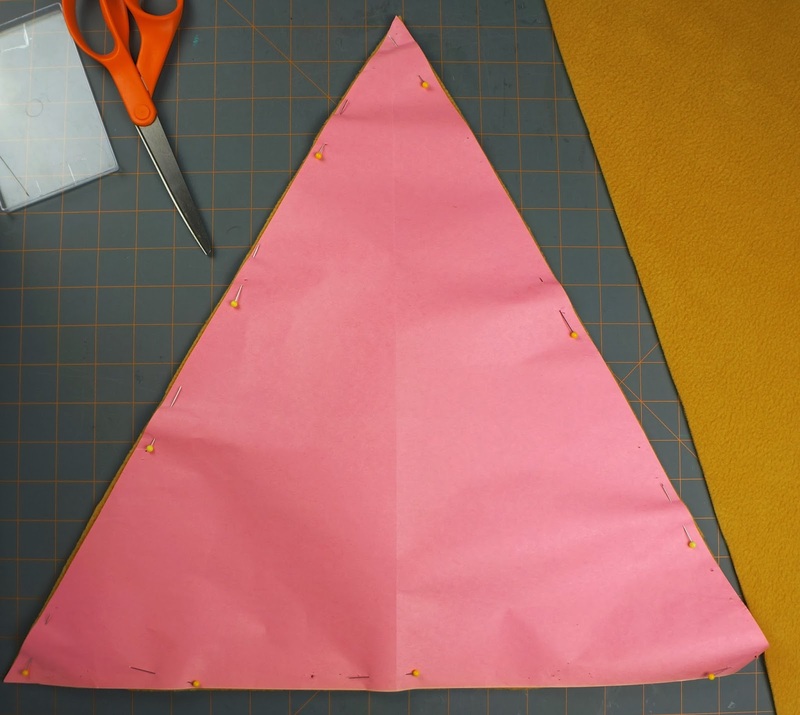 Using your template, fold it in half to find the center and place the point of the triangle at the dead center and the rest along the line of pins. 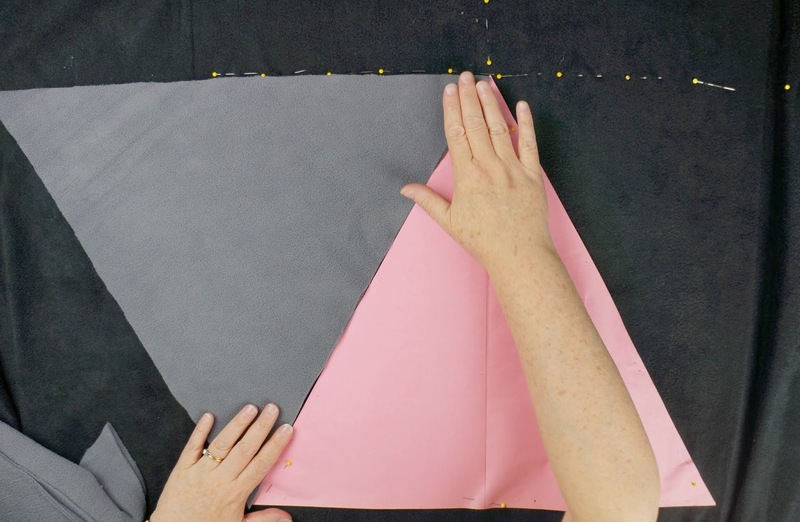 Pin the template to the black, this is going to help you place the fleece triangles. With the template acting as the middle of the Triforce, start to pin down the fleece triangles. Make sure that they are very securely pinned in place. 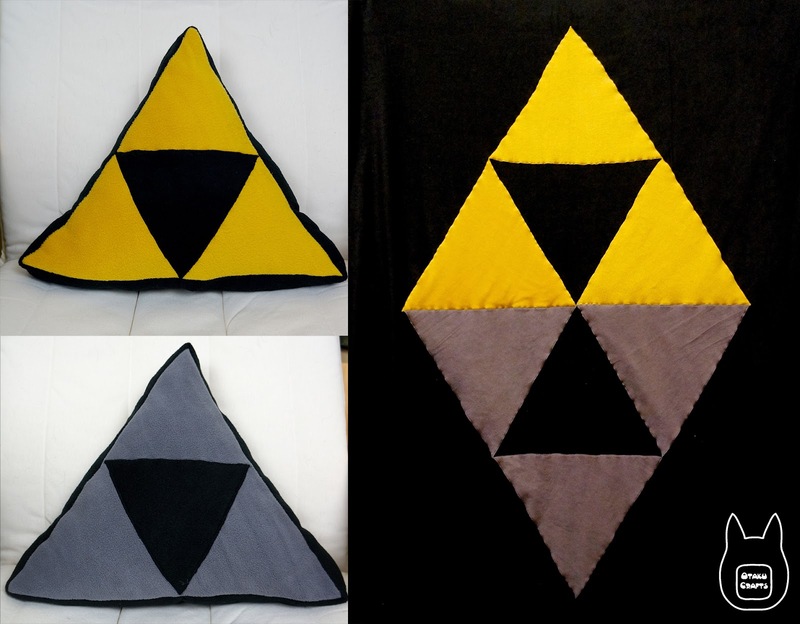 Do that for all 3 of the same colour so that you have one big Triforce. 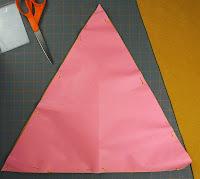 Remove the paper template before you start to sew the triangles on. Now begin sewing the triangles on. 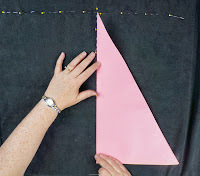 We used a wide zig-zag stitch (satin stitch). Sew the entire outside of the Triforce first, then sew the inside of the three triangles. 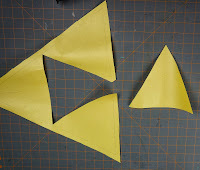 Do the exact same thing for the other Triforce. 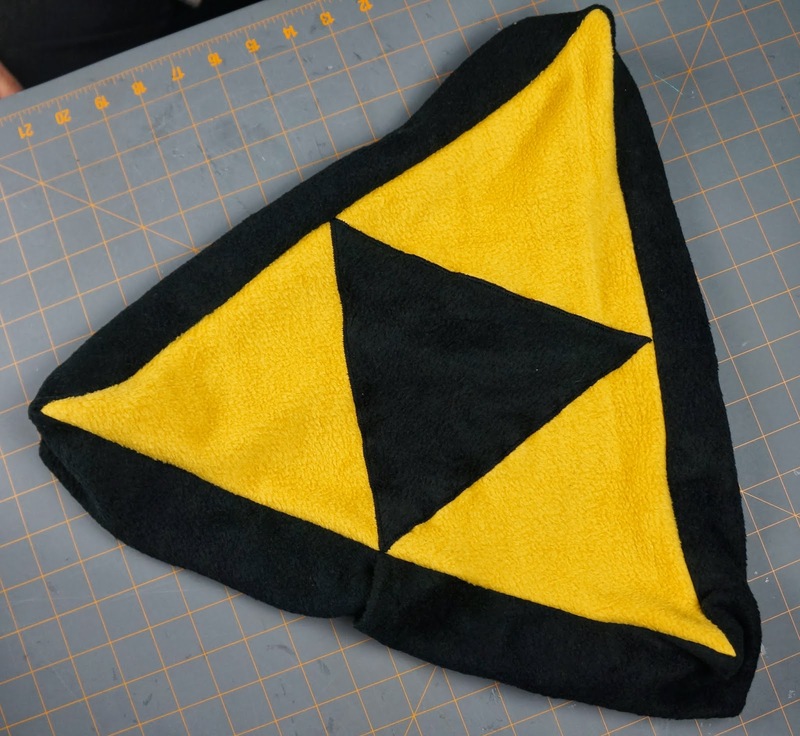 Now you can finish the edges of the blanket if you like. We used some gold thread and a speciality stitch on the sewing machine. 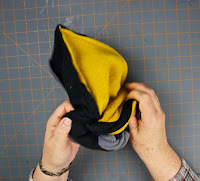 You could also use some gold yarn and blanket stitch around the edges. And your finished! 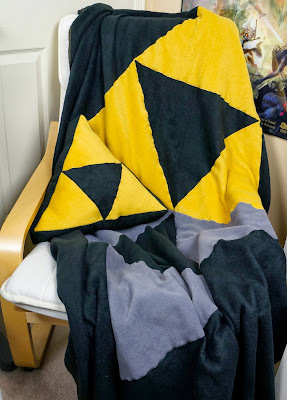 Now you have your very own A Link Between Worlds pillow and blanket set! I want. So much want, like, I want this, and I want it bad.